The STUC and Fire Brigades Union have joined charities in supporting the move. Period poverty: Consultation closes at midnight on Friday (file pic). 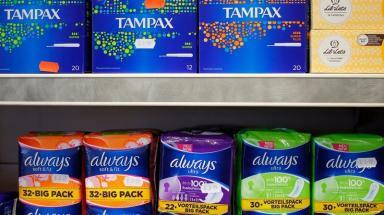 Trade unions and charities have signalled their support for legislation to provide free sanitary products as a nationwide consultation draws to a close. Views on Labour MSP Monica Lennon's proposed members' bill aimed at ending period poverty in Scotland can be submitted until midnight on Friday. The bill would place a legal duty on Scottish ministers to ensure there is free access to sanitary products in Scotland, including in schools, colleges and universities. The proposal has attracted support from organisations including the Scottish Trades Union Congress (STUC), the Trussell Trust Scotland, the Educational Institute of Scotland (EIS), Glasgow Airport, Engender, the Fire Brigades Union (FBU) and the Union of Shop, Distributive and Allied Workers (Usdaw). Ms Lennon said: "I'm delighted that my proposed members' bill consultation has gained such widespread support over the past few months. "The consultation remains live until midnight on Friday, December 8, and I would encourage anyone who hasn't already done so to respond online by visiting www.periodpoverty.scot and make their views known. "I look forward to fully analysing all of the responses following the close of the consultation and taking forward my proposals to tackle period poverty." Denise Christie, FBU Scottish secretary, said: "We believe that sanitary provision is a basic human right and all women and girls should be provided it free regardless of their income. "The FBU have many examples of firefighters starting their periods at work and cannot leave to access sanitary provision as they need to stay in the fire station on call. "This also occurs at protracted incidents where firefighters are working for many hours without access to sanitary provision. It's important that provision is accessible on fire stations and on fire appliances." First Minister Nicola Sturgeon's programme for government subsequently committed to introduce a scheme to fund access to free sanitary products in schools, colleges and universities. Engender's submission to the consultation said: "Whilst Engender supports the recent announcement by the Scottish Government that free menstrual products will be provided in schools and universities, we believe that the scope of this initiative should be extended to include any person in Scotland who faces barriers to menstruating in a safe, healthy and dignified way. "Menstrual cups, tampons and pads are all essential healthcare products and there should be no barriers to their access or use. Menstrual care is health care."